The Freedom Foundation of Minnesota (FFM) is a state-based think tank and member of the State Policy Network. The Freedom Foundation describes itself as "an independent, non-profit educational and research organization that actively advocates the principles of individual freedom, personal responsibility, economic freedom, and limited government." Annette Meeks, former Deputy Chief of Staff for House Speaker Newt Gingrich, founded FFM in 2006 and currently serves as CEO. In 2009 the foundation was a co-sponsor of the Heartland Institute's 2009 conference for climate change skeptics. Freedom Foundation of Minnesota founded Minnesota Watchdog. The Freedom Foundation of Minnesota was listed as a Franklin Center for Government and Public Integrity "Watchdog Bureau". 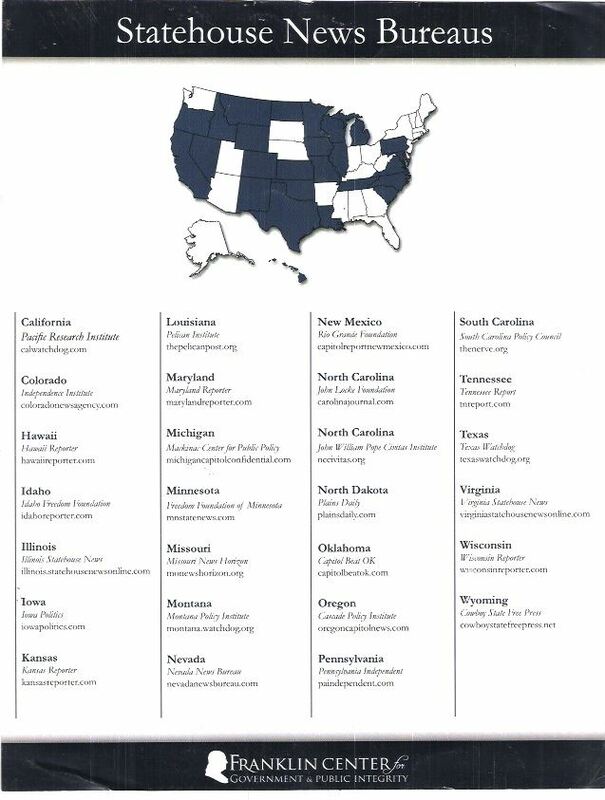 The Franklin Center funds reporters in over 40 states. Despite their non-partisan description, many of the websites funded by the Franklin Center have received criticism for their conservative bias. On its website, the Franklin Center claims it "provides 10 percent of all daily reporting from state capitals nationwide." ↑ Heartland Institute, "International Conference on Climate Change: Global Warming: Was It Ever Really a Crisis? ", March 8-10, 2009, page 32. ↑ Alliance for a Better Minnesota, Who's in Charge: How Nationalized Corporate-Run Think Tanks Influence Minnesota Politics, organizational report, November 13, 2013. ↑ Freedom Foundation of Minnesota, IRS Form 2014 990, Freedom Foundation of Minnesota, August 6, 2015. ↑ Freedom Foundation of Minnesota, IRS Form 2013 990, Freedom Foundation of Minnesota, August 15, 2014. ↑ Freedom Foundation of Minnesota, IRS Form 2012 990, Freedom Foundation of Minnesota, November 15, 2013. ↑ Freedom Foundation of Minnesota, IRS form 990, 2010. GuideStar. ↑ Freedom Foundation of Minnesota, IRS form 990, 2009. GuideStar. ↑ Freedom Foundation of Minnesota, Staff, Freedom Foundation of Minnesota, 2016. ↑ Freedom Foundation of Minnesota, Board, Freedom Foundation of Minnesota, 2016. This page was last edited on 2 November 2018, at 19:36.